ARTESIA — An early-morning, single-vehicle wreck on 26th Street has resulted in the death of one man and an ongoing search for another. The accident was reported just before 1:25 a.m. Saturday near the Country Club Estates mobile home park on 26th Street. 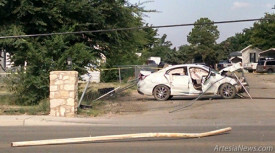 The white passenger vehicle pictured above in one of the entrances to the park appeared to have crashed through chain-link fencing and also struck a utility pole, cutting power in the area for several hours. … For the rest of the story, subscribe in print and on the web.